Facing this if i enable gtk,gl option same is with sd2 gl options. in front of the g_assert_not_reached() in that function, and report which value is printed when you run it again? OK, thanks for checking. Pixel format = 0x20020888 is the PIXMAN_x8r8g8b8 format, if I've got the pixman.h header right. So could you please try the following patch to see whether it fixes the issue for you? Uh, seems like the web interface ate up the spaces in my previous comment. Here's the patch as attachment instead. but i continue have the black display here,look like the emulated hardware have a issue someware. (check the attached image)... the strange of this issue is it was not present before and not is relative something about sdl or gtk . I try all the options available adding a bios, changing the vga the machine type, gave a cpu option but nothing... all the time the same issue. I will check your patch on qemu 2.5.1 and on fedora 24 for confirm everything working right. tested on 2.5.1 and the patch is working. When you say it's failing with qemu 2.6, are you using the official release 2.6.0 or the current version from the git repository? Also, which target machine are you emulating? x86_64? ppc64? on Fedora 24 all is working right . I think there is something broken on ubuntu 16.10.
is possible add the sdl patches on BigEndian on Qemu 2.5.1 ? 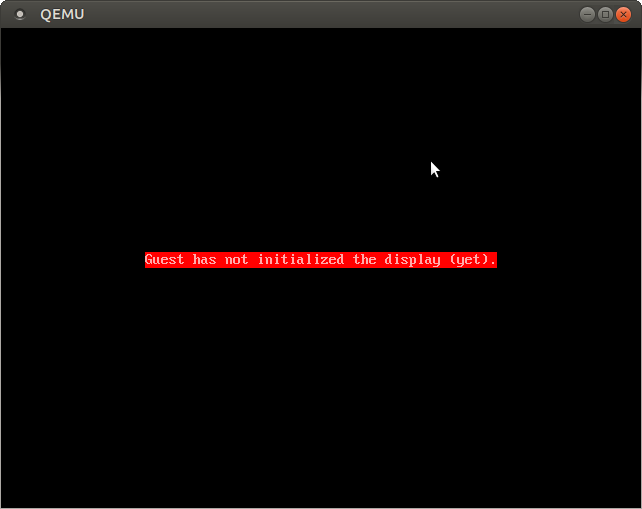 the lastest are not initializing the display i dont understand what appening with last qemu on Big Endian. Sorry, I didn't quite get your question ... do you want to see the patch included in the 2.5 stable branch (i.e. included in version 2.5.2)? Or do you have a problem applying the patch on top of 2.5.1 on your own? Well, QEMU 2.7 is likely to be released next months, so I'm not sure whether there will be another 2.5.x stable release ... but if you like, you can try to send the patch to the qemu-stable mailing list (that's the official way to get a patch included into the stable tree) and ask to include it in 2.5.2 if it ever gets released.